The Loakan airport is one of the few domestic airports in the country that caters to limited commercial flights but are sparing used for chartered and military flights. The operation of an airport, whether domestic or international, is a key factor in ensuring connectivity of a part of the archipelago with the outside world and is viewed as a vital driver of economic growth in the said strategic places. For several decades, the Loakan airport served as the city’s direct link with other similarly situated areas in the country. The airport had been operational for commercial flights until the airline servicing the Manila-Baguio-Manila route ceased operation over a decade as an alleged losing venture. However, the airport remained open for chartered and military flights considering the strategic location of the city in the Northern Luzon area. The importance of an airport in a certain area in the country was demonstrated during the post-disaster operations following the intensity 7.9 July 16, 1990 killer earthquake where the only means for immediately bringing in relief goods from the national government and other donors was through the air. All roads leading to the city then were closed to traffic because of massive landslides that took several weeks to break through enough for the entry of aid and allow the flow of traffic going in and out of the city. After the wrath of Typhoons Pepeng and Ondoy in October 2009, all roads leading to the city were again closed and the Loakan airport again served as a vital facility in bringing in relief supplies for the isolated populace as the supply of essential goods and medicines were running low. Subsequently, the Regional Development Council (RDC) in the Cordillera proposed for the rehabilitation and upgrading of the Loakan airport through the installation of the appropriate instrument landing system (ILS) equipment to allow the airport to be operational even during bad weather condition. As experienced in the past, aircrafts cannot land in the airport during bad weather because of poor visibility and a short runway amidst towering and massive mountains making the landing of aircrafts in the facility challenging, especially for neophyte pilots. The RDC-CAR submitted to the concerned government agencies earlier studies showing the need to upgrade the airport and its existing landing equipment to make it serviceable for the growing need of the travelling public for flights to and from the city that will maximize their time, effort and resources in achieving their intentions in coming to the city. Previously, there was also a plan to close the Loakan airport and convert the same as an expansion area of the Philippine Economic Zone Authority (PEZA) but the same was vehemently objected by various stakeholders in the city causing the plan to be shelved. The airport has a runway measuring approximately 1.6 kilometers surrounded by communities. The presence of communities in both sides is a major hindrance in the proposed expansion of the runway and the planned upgrade of the facility. The existence of pedestrian and vehicular traffic right at the center of the airport was also raised as a security issue that prompted the proposed construction of an alternate road in one side of the airport for people living in the communities on the other side of the airport so that the same will be totally closed to pedestrians, animals and motor vehicles. It took Socio-Economic Planning Secretary Ernesto Pernia a visit to the airport to make the definite pronouncement that the proposed rehabilitation of the airport is doable. He also insinuated that if the funds for the proposed rehabilitation will not be sufficient, additional funds could be sourced out from the annual budget of concerned government agencies and the appropriations could be done on a multi-year basis. 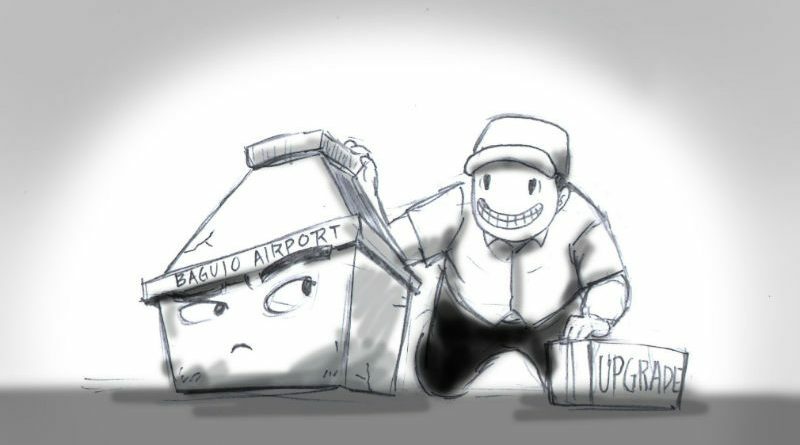 We believe Baguio city deserves a functional state-of-the-art airport to serve airlines interested in servicing the route. It is also important for the city’s business sector to ensure the viability and sustainability of the operation of the airport to serve as a major economic driver through the influx of high-end visitors. We also agree to the pronouncement of Secretary Pernia that the Loakan airport is strategically located in the heart of Northern Luzon that it could serve as a jump-off point for routes leading to other prime tourist destinations in the other parts of the country, like Batanes, Boracay, among others. Let us support the endeavour of government to upgrade the airport and for it to exercise its power of eminent domain over encroachments to allow the airport to expand and be a contributor in the city’s economic growth.